Alumni and Lifeguard Union Party at the Central Mall (9PM) to follow the races on Saturday, August 1st, $10 food and drink. On Monday April 12th, 2015 myself, Derek Angermaier and Cary Epstein met with Parks Management in follow up discussions about the upcoming 2015 summer season. First on the agenda was the 2% raise and retro. We were told by Chip Gorman that the problem has been solved and we should be getting the monies owed to us by late June. The captains and lieutenants meeting will be held in Babylon State Park Headquarters on Thursday, May 14th, 2015 at 6:00PM. The state agreed to purchase 3 kayaks and 3 surfboards that will be used for rookie training only. The airshow featuring the Thunderbirds will take place Memorial Day weekend. The Air Show will be from 12 PM - 5PM this year. There have been problems with Lifeguards arriving on time due to the increase in traffic. Make sure you allow plenty of time to arrive on time! Shifts are yet to be determined. Once again, Eddie Costigan and Kevin McAuliffe will be our eyes and ears on the command vessel off the Central Mall. There has been much discussion between the state and JBLC as to pre-season staffing. The state would prefer that a lifeguard assigned to a beach at the beginning of pre-season to stay at that beach until their beach opens. This especially applies if you are assigned to Sunken Meadow. They are trying to limit movement during pre-season. This will be discussed at the meeting on Thursday, April 30th, 2015 at 7:00PM at 1000 Woodbury Ave., Woodbury, NY. Drone use is prohibited at state parks unless you receive a permit. Especially note the JBLC Inter-beach Races are back. We expect a great turnout from all beaches! There will be a party to follow the Races. The first rehire test is just under 2 weeks away- Saturday, May 9th 2015 at the Suffolk Community Pool. Hope to see you there! 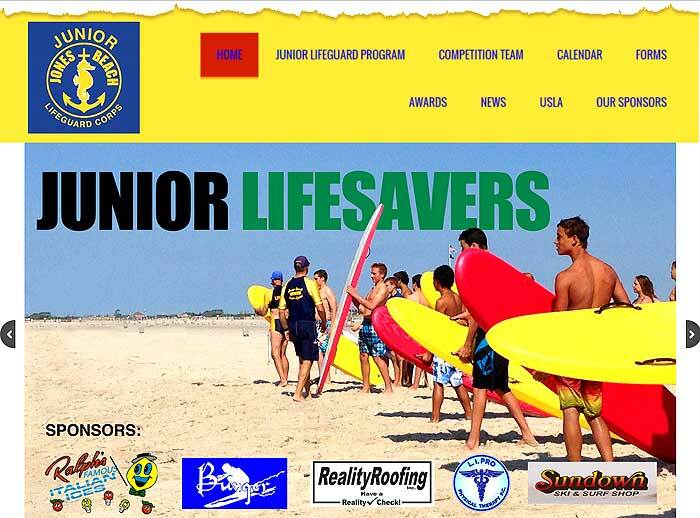 Check out the brand new Jones Beach Junior Lifeguard Website! The Jones Beach Junior Lifeguard Program will be holding tryouts on Tuesday, June 16th, from 6:00 p.m.-8:00 p.m. at Suffolk County Community College ( SCCC - Brentwood Campus Pool). Please report to the deck by 5:45 p.m. All athletes must be accompanied by a parent /guardian, who must complete an application and sign a waiver. The cost of the tryout will be $5.00. -Ages determined prior to July 1st of 2015. -Athletes must be 10 prior to July of 2015. 25 openings for 10 year olds. There may be openings in selected age groups. If a group has no openings, then no new athletes will be selected. Copies of BIRTH CERTIFICATES are required. The Jones Beach Junior Lifeguard Program will be held each Sunday morning from 8:00 a.m.-10:00 a.m. beginning Sunday June 28th to Sunday, August 9th at the East Bathhouse (EBHO). Further instructions regarding who made the team and the first practice will follow.